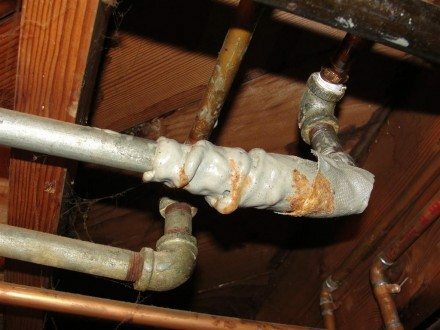 If you’re buying an old house, beware of old water pipes; specifically, galvanized steel. These pipes build up with sediment on the inside, making the inside diameter of the pipe smaller and smaller over time, eventually to the point where water flow is unusable. 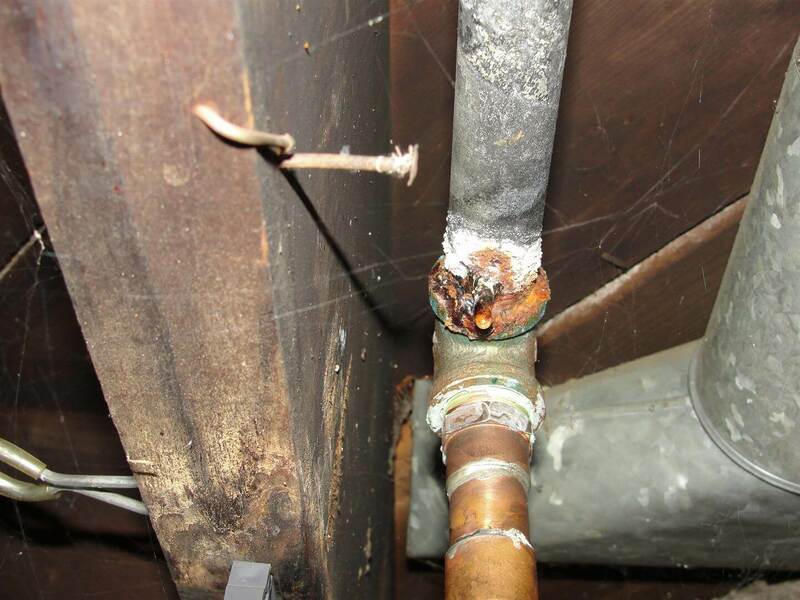 These pipes also corrode at the joints, which can lead to leaks. The mere presence of galvanized pipes doesn’t constitute an immediate action item, but it does mean that the water distribution pipes in the house should be looked at and tested more thoroughly during the home inspection, especially if there is any evidence of past leaks. The water supply piping is what brings water from the street to the house. 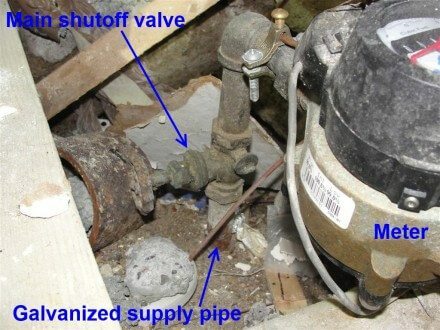 To identify the type of material, take a look at the water piping where it comes into the basement before the first shutoff valve, which should be located right before the water meter. If this water piping has a threaded fitting, it’s probably a galvanized supply pipe. This is always bad news. The other types of water supply pipes are copper, plastic, and lead. Copper and plastic are good news, lead is not. 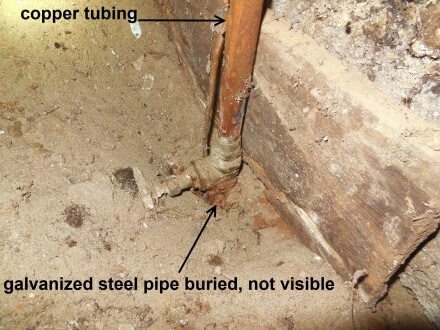 If you see a thicker pipe coming up out of the basement floor with threads on the end, it’s probably a galvanized supply pipe. Galvanized or lead water pipes were installed in Minneapolis homes exclusively up until 1928, and in Saint Paul homes up until 1925. Minneapolis’ transition to copper water supply pipes was complete by 1932, and Saint Paul’s transition was complete by 1926. 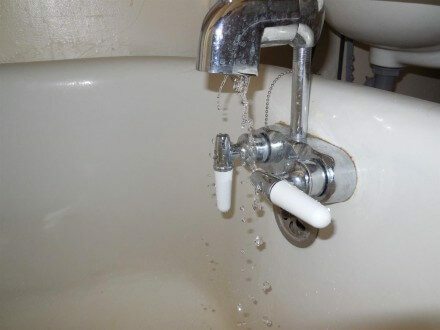 Most Minnesota homes with galvanized supply pipes have such poor water flow that doing laundry and taking a shower at the same time is not possible. 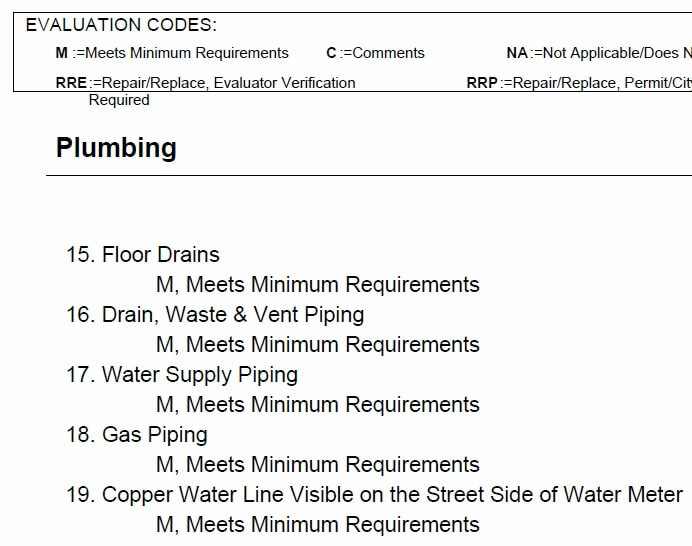 If the home is in Minneapolis, take a look at item #19 on the Truth-In-Sale of Housing evaluation report; this item asks if the water supply piping is copper. If the piping is copper, this item should be marked as “M”. If the piping is something else, such as galvanized steel, lead, or plastic, this item should be rated “C” for comment, and there should be a comment stating the water supply piping was not copper. 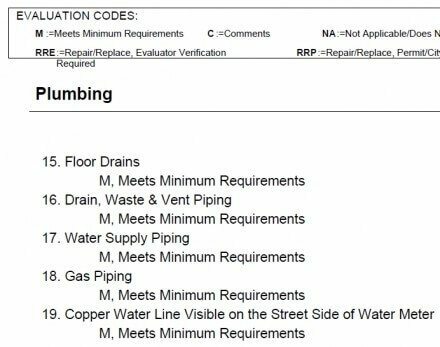 A better description for item #19 would probably be “Copper or Plastic Water Line Visible on the Street Side of Water Meter”, but these reports have a lot of old language in them that takes a lot of effort to change. If the water piping coming into the home can’t be found, access is blocked, or the main valve is located too close to the floor to determine the type of water supply piping, one option is to call the municipal water works department to find out what type of water supply piping the house has. This is easy to do in Minneapolis, as they keep detailed records of exactly what type of water supply pipe was installed, and when it was installed. The two photos below show a home with a galvanized water supply; all that can be seen is copper, but the piping below the earth is actually galvanized. I’ve had a couple of inspections in Minneapolis where the water flow throughout the house was quite minimal, yet all of the water piping looked great, and there was a copper water supply entering the house. In those cases, my curiosity got the best of me and I called the water works department to get the history on the water supply. Apparently, the water supply piping didn’t always get replaced entirely. In some cases, there would only be a partial replacement out to the street. The fix is to have the yard / street dug up again and have the rest of the water supply replaced. An easy way to determine a problem with the water supply pipe is to quickly turn on an exterior faucet. If water comes out with a burst but the flow drops noticeably after a fraction of a second, it’s almost certainly a problem with the water supply for the house. In most cases, this indicates an old galvanized supply pipe, but could also indicate a problem with an old lead supply pipe. The video clip below shows an example of this, but it’s not very easy to see. There is only a slight change in flow, but it was enough for me to know there was a problem. The clip shown above was also the first clip in a compilation of 47 home inspection video clips in under 3 minutes that I put together, which I have featured at the top of our home page. I’ve received a number of requests to explain some of the problems in that video, and I’ll be attempting to do that through blog posts over the next year or two. If the water supply pipe to a house needs replacement, plan to spend several thousand dollars. The yard will need to be dug up and the water supply pipe replaced out to the street. The homeowner pays for this. If the city water line is on the opposite side of the street, it’s more expensive. To determine which side of the street the water supply is on, look for fire hydrants. If the home has a lead supply pipe, water flow may be restricted because of a damaged pipe, but I’ve inspected plenty of homes with lead water supply pipes that still had acceptable water flow. The other obvious concern with a lead water supply is with lead leaching into the drinking water for the home. In these cases, the water can be tested for lead. Visit the EPA for more info on lead in water. Galvanized steel water distribution pipes were used almost exclusively in Minnesota homes up until about 1950, when copper tubing began to replace galvanized pipes. Copper gradually replaced galvanized piping during the 1950’s, and was about the only thing used for water pipes in homes by 1960. 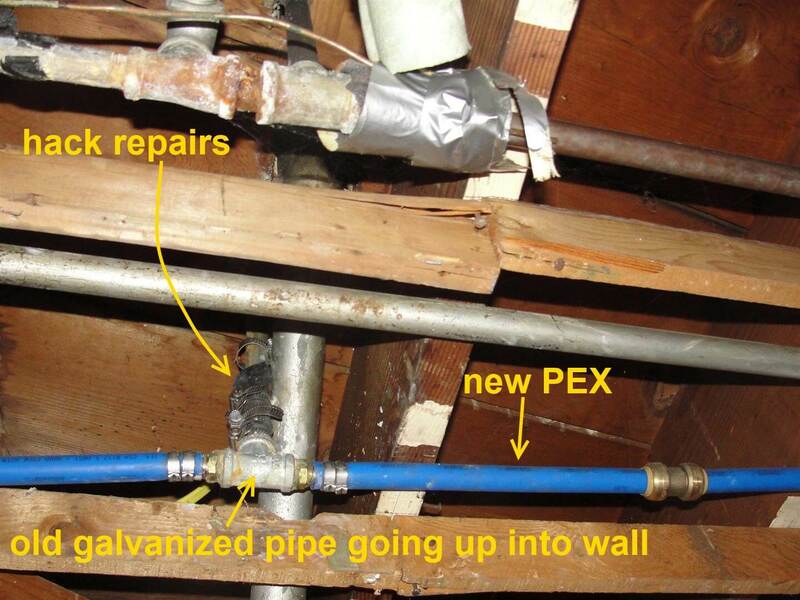 CPVC and PB tubing gained some popularity during the 90’s and early 2000’s, but today PEX is pretty much the only thing used for water distribution piping in new Minnesota homes. To identify the presence of galvanized pipes, start by looking in the basement. As soon as the water supply pipe enters the house, there will be a shutoff valve, a water meter, then another valve. After that, the water distribution pipes will branch off to the rest of the house. If the home has been re-piped or partially re-piped, it will probably have been done with copper or PEX tubing. It’s easy to tell the difference between copper tubing and galvanized pipes because galvanized pipes have threaded fittings, while copper tubing has soldered joints. 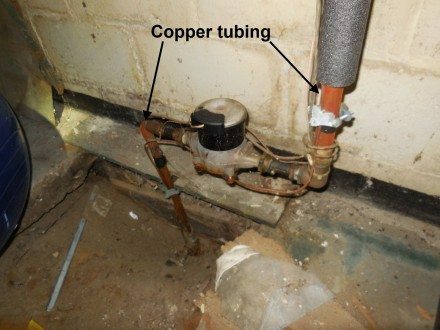 If the home has been partially re-piped, there will typically be newer copper tubing in the basement, and the water lines will transition to galvanized piping at the basement ceiling just before disappearing into the walls. The photo below shows an example of a partial replacement by some complete hack. 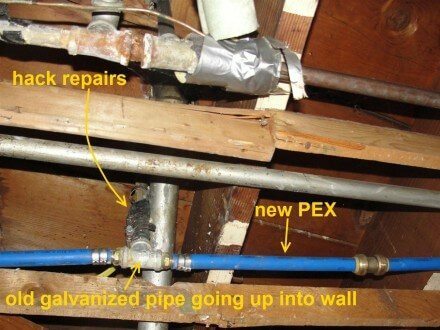 Sometimes, houses can have galvanized pipes that are still in acceptable condition, and water flow is still acceptable. To help determine if water flow is acceptable, try this test that I’ve adopted from the Minneapolis Truth-In-Sale of Housing Evaluator Guidelines. Start by running hot and cold water at the laundry sink faucet, then run upstairs to the highest plumbing fixture, preferably a shower, and verify there’s still water flow. If there is no water flow or insufficient flow to take a shower, it’s a major concern. In most cases, no flow at the upper fixtures under these conditions indicates a problem with the water supply pipe, or old galvanized water distribution pipes in need of replacement. A couple of other possibilities would be a main shutoff valve that’s partially closed, or a problem with a water softener that restricts water flow throughout the house. There are too many variables for me to cover every possible scenario, but hopefully these tips give enough info to conduct a basic test for water flow on old houses.